Me and my Little Angels always love to have high tea or buffet spread because there are lots of choices. We can just pick a little of everything to try on which is quite satisfying. Here we are having our high tea at Food Factory, a new dining experience located at the 3rd Floor of First World Plaza. The new restaurant offer more than just great food coz' children especially would be thrilled to watch the chefs at work which use extraordinary machinery to make food. The Food Factory covers 23,568 sq ft and comes with an open kitchen equipped with some heavy-duty kitchen gadgets. Designed specially to cater for tour groups and MICE market, the restaurant can accommodate up to 1,300 diners at one time and is normally open for breakfast. The High Tea buffet offers great variety with food presented on separate counters i.e. Western, East Asian, West Asian, Pizza, local delights and drinks. The Western Counter is laden with various delicious dishes from seafood platter to assorted salads with condiments, Roast Rosemary Chicken with Potatoes and Vegetables, Roasted Chicken Roll, Chicken and Lamb Sharwama, Beef and Chicken, Sauteed Pasta with Cream Carbonara Sauce or Bolognaise, Sauteed Spanish Sausages and Sauteed Lamb Ball with Hot Sauce, Breaded, cream of mushroom and chicken soup. The Chinese or East Asian Counter offers sumptuous local favourites such as Fish Ball Noodle Soup, Curry Noodle Soup, Fried Carrot with XO Sauce, Grilled or Deep-Fried Yam Roll, Deep-Fried Cheese Roll, Chee Cheong Fun, Fried Loh See Fun, Fried Yee Mee and Dim Sum. There are also variety of local cuisines such as Malay and Nyonya Kuih, Nasi Lemak with condiments, Roti Jala, Potatoes Samosa, Vegetables Pakoras, Tandoori Chicken, Fish Head Curry, Ayam Masak Merah, Chicken and Lamb Skewer. For light snackers, there are finger foods such as Margherita Pizza, Chicken Ham Pizza, Toasted Bread with Kaya and Butter, Fried Banana and Sweet Potatoes. To deliver a food that must be quickly made but served fresh, the restaurant has a few "giant" cooking utensils such as a pancake machine that can make up to 200 pieces of pancakes in approximately 30 minutes and a pizza conveyer machine, both from US and a machine for making fried rice and noodles that was made in Hong Kong. As for the Fried Noodles recipe, a total of 88kg of boiled noodles, 10kg of chicken slices, 16kg of prawns, 150 eggs, 16kg of Chinese cabbage, 10kg of carrot Julliane, 5kg of mushroom slices and 20kg of beansprouts are needed to serve 2,000 people each day. 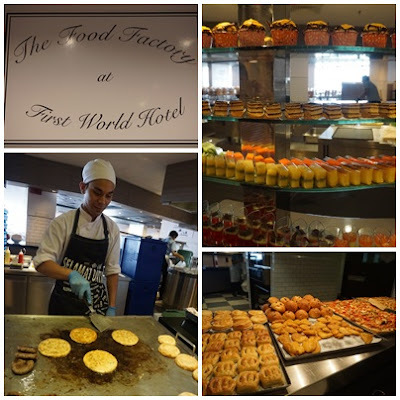 Sous Chef Murugan Subramaniam says, "We have made dining at the Food Factory an interesting one. Firstly the buffet line is an open concept. Having these machines to help churn out food as quickly as possible offers an interesting show for our customers and is especially appealing to children if not also the young at heart. It's not a surprise when it is only at The Food Factory one gets to see these machines at work. The High Tea at the Food Factory offers great food at just RM10 nett for children between five and 11 years old and adult at RM38 nett only. The buffet only available from March 12 to 20 and on March 26 and 27 from 1pm to 5pm. More food photos at the link HERE. Me and my Little Angels enjoy the food at the Food Factory and we also enjoy watching the chefs in action, preparing great and hot piping food to all us. Each dishes were freshly made and full of flavours of International food. With only RM10 nett per child, I found the price is quite reasonable for all of us to enjoy the yummylicious food at the top of the mountain. What a generous buffet spread. I am quite surprised to learn that despite being in Genting, it is not too expensive. Fish, indeed it is. Come and try it yourself. Hui Ying, really creative way of displaying each and every food till mades me feel hungry too. Miera, try it yourself and eat all you can here. Wow, the kids are so lucky! Joyce, indeed they are having Mom as bloggers. Can eat variety of food and join variety of activities. Sabrinah, Genting not far lar. Just an hour drive from KL. It is a great place for food and entertainment. Wow so much food to enjoy over the weekend. I want to join mummy Jane yo Genting Highlands also.